Lapointe, Pierre Louis. "New Richmond". The Canadian Encyclopedia, 04 March 2015, Historica Canada. https://www.thecanadianencyclopedia.ca/en/article/new-richmond. Accessed 18 April 2019. Although New Richmond is today about 80% French-speaking, its history is steeped in cultural diversity. New Richmond, Qué, Town, pop 3748 (2006c), 3760 (2001c), inc 1969. New Richmond is located on the north shore of CHALEUR BAY on the GASPÉ PENINSULA. Facing the sea, the town is surrounded by the majestic Chic-Chocs, the mountainous backbone of the peninsula. The area is rich in minerals and the source of the 2 salmon rivers which flow into Chaleur Bay at New Richmond: the Grande Cascapédia and the Petite Cascapédia. Although New Richmond is today about 80% French-speaking, its history is steeped in cultural diversity. The first settlers, ACADIANS who had fled the 1755 deportation, were followed by United Empire LOYALISTS who made their home there in 1784 and by Scottish and Irish immigrants who arrived in the 19th century. The Gaspesian British Heritage Centre, one of New Richmond's most colourful attractions, is a historic village which recreates the way of life of those early British settlers and recounts their contribution to the development of the Gaspé Peninsula. The name New Richmond, which first appeared on Joseph Bouchette's 1815 map, was inherited either from the Loyalists or from the British colonial bureaucracy's systematic borrowing of British geographical names. New Richmond was set up as a township municipality in 1855 and as a town in 1969. New Richmond's main industry, a Stone-Consolidated cardboard mill, was opened in 1966. For more than 50 years before then, the pulp and paper mill in Bathurst, NB, relied heavily on Gaspé forest resources, which were floated across Chaleur Bay. 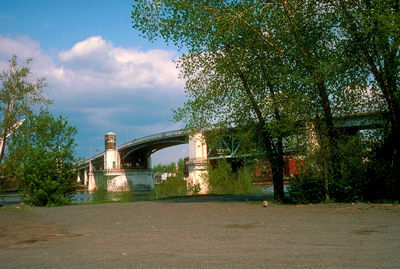 The decision of Jean LESAGE's Liberal government to limit the export of unmanufactured Québec timber brought about the building of New Richmond's mill. Sportfishing, canoeing and sailing are popular tourist activities in New Richmond. There is also sightseeing at Taylor's Point and at the hamlet of Saint-Edgar, which also contains a forestry museum and the fourth-longest covered bridge (constructed 1938) in Québec.